But a review of the responses found that some individuals were not aware they apparently had become part of an organized campaign to oppose what's known as the "340B" program. Some had no memory of signing anything, much less sending their opinions about it. Of the 1,406 comments that specifically mentioned 340B — part of several thousand comments submitted on a broad proposal to revise medical payment systems — about half included the same or similar wording and were submitted anonymously, an analysis by Kaiser Health News found. Those comments lamented "abuse" of the drug discounts, faulted hospitals for being "greedy" and used phrasing such as "quality, affordable, and accessible." They "are clearly related," said Robert Leonard, a forensic linguistic expert at Hofstra University whose team analyzed the submissions for KHN. Cancer survivor Janice Choiniere's name is on a public comment saying reform of the 340B program will help "those suffering from this insidious disease." But when reached by phone, the 69-year-old Florida resident said she had "no idea" what the program is and didn't recall signing a petition. "My first thought is, I don't fill out and send in responses casually," Choiniere said. "I'm hoping nobody lifted my information." The quarter-century-old federal program requires pharmaceutical companies to sell certain drugs at steep discounts to eligible hospitals and clinics, which don't have to share their savings with patients. Critics, including Republican lawmakers, have questioned what the facilities do with the money. Doctors in private practice, who are not eligible for the reduced rates, have warned that the program's continued growth makes it susceptible to exploitation. The administration's plan, finalized in November, reduced by $1.6 billion annually what the Centers for Medicare & Medicaid Services pays for the targeted drugs. In late July, the agency proposed expanding those payment cuts. "It feels like inappropriate influence," said Peter Ubel, a physician and behavioral scientist at Duke University's Fuqua School of Business. "When you have a life-threatening illness, you need to know you can trust your physician to care about your interests ahead of their own." Two patients confirmed they had written notes, although they couldn't say when. Several said they must have signed or written something amid the paperwork handed to them at a doctor's office during appointments or in follow-up correspondence. A few drew mental blanks. The name of an 84-year-old melanoma patient shows as an online signature in an individual public comment that described the program's reform as a matter of "life or death." But the Florida man, who asked not to be identified, had little recollection of writing it. His wife remembered that he signed something at his doctor's office "out front on a clipboard" before getting his biweekly cancer treatment. "If my doctor wanted me to sign something, I would sign it for him," the man said. He "saved my life." Julie Yarbrough, whose husband received treatment at New England Cancer Specialists in Maine, remembered signing a petition "at the [doctor's] check-in area" about hospitals abusing 340B discounts. She was the only individual contacted who had a basic understanding of the program. "We do a good job of educating patients and letting them know how to get involved," said Michael Diaz, director of patient advocacy for Florida Cancer Specialists and vice president on the Community Oncology Alliance's executive committee. "They need to be able to contribute and give their opinion." Steve D'Amato, executive director of New England Cancer Specialists and an Alliance board member, mentioned patients' support in a letter accompanying a petition posted multiple times to the government portal Oct. 10. The petition included the trade group's website; D'Amato noted that "patient signatures obtained in just 2 days" were attached. When asked recently about patients who didn't recall signing something, D'Amato said he did not have the petition in front of him and referred all questions to the Alliance's executive director, Ted Okon. In an interview, Okon denied that the organization had any role in soliciting patient comments. "We didn't do anything with patient petitions," said Okon, although talking points and material were sent to practices nationwide for them to use when submitting comments. "This is what we do in terms of advocating." 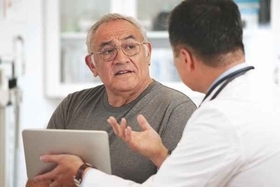 Susannah Rose, scientific director of research in the Cleveland Clinic's patient experience office, said there is "always a worry about coercion" when doctors make a request of patients, but more so when oncologists do the asking. "Cancer patients often feel very much in the hands of their oncologists, and they are often suffering from significant distress," said Rose, who serves on the ethics committee of the American Society of Clinical Oncology. The Washington-based Alliance represents private oncology practices as well as about 50 corporate members, according to its website. Formed in 2003 when Congress approved Medicare's prescription drug program, it was a leading critic of a controversial 2016 proposal to change how CMS paid for some drugs in Medicare. The group's revenue nearly quadrupled that year, to $16.3 million from $4.4 million in 2015, according to federal tax filings. The proposal never became reality. Walgreens and PhRMA, the pharmaceutical industry trade group, also confirmed membership but did not disclose how much they pay in dues. Okon said corporate membership fees range from $25,000 to $75,000 annually while individual oncologists and their practices pay "usually on the order of a thousand dollars, two thousand dollars." Drug manufacturers do not influence the Alliance's position on 340B, he said, noting in an email that "correlation is not causality." After the comment period ended, CMS slashed 340B payments to hospitals by $1.6 billion annually. Medicare had been paying hospitals 6 percent above a drug's average sales price; it now pays them 22.5 percent less than the average sales price. CMS Administrator Seema Verma and Eric Hargan, deputy secretary of the Health and Human Services Department, emphasized that public comments played into their decision. In the 1,133-page final rule, they said they shared the concern that current Medicare payments "are well in excess of the overhead and acquisition costs" for drugs bought under the program. "We thank the commenters for their support," they wrote. Hofstra University professor Robert Leonard, and analysts Juliane Ford and Dakota Wing who work for his consulting firm, compared those three comment types with a letter submitted to regulators in September by Community Oncology Alliance, a nonprofit advocacy group. COA's comment letter included 2,928 words. The three duplicated comments used 242, 260 and 306 words. The analysts used a technique that tallies the number of N-grams, which is a set of serial words found in a string, shared in each document. They found multiple examples. One near 10-gram sequence that appeared in all 763 comments is a variation of the sentence: "The mission of COA is to ensure that cancer patients receive quality, affordable, and accessible cancer care in their own communities." It varied by the use of a few words, such as changing "communities" to "community" or using the word "local" instead. Notably, the use of an Oxford comma in the same string of words — "quality, affordable, and accessible" — appeared in all four comments. "It defies imagination that three or four individual people would pick the same words in the same strain," said Leonard, who is director of the graduate program in forensic linguistics at Hofstra University. The frequent use of the informal word "bad" also caught the attention of researchers. And two comments that were duplicated hundreds of times made the same grammatical mistake — using a non-standard plural "American's" with a superfluous apostrophe.